With LeBron James now heading to his 7th consecutive NBA Finals, he now passes Michael Jordan as the All-time scoring leading in the playoffs. Which means sports fans with LeBron memorabilia should consider keeping their treasures safe by having them custom framed. Do you have an autographed LeBron James jersey that you don’t want getting dirty? Custom frame it by adding a matte cut out of the achievements LeBron has made over his career. 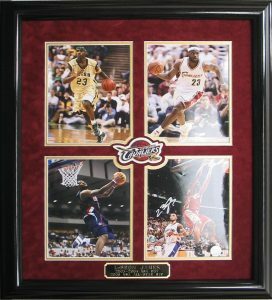 Here is an example of a custom framed LeBron James jersey CSD Framing did in 2009. 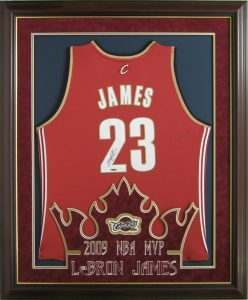 The frame consists of a autographed LeBron jersey with a custom ‘crown’ matte cut to symbolize “King James” and his MVP accomplishment during his 2009 season. This is just one example. When it comes to CSD Framing, the designs are limitless. Create a custom frame for your memorabilia that will surely make your buddies jealous when they come into your man cave. Of course, CSD Framing understands fans might want to wait to “witness” what happens in the NBA Finals this year before they decide on a design for the custom frame. But all fans should start to consider preserving LeBrons memorabilia because the King reign doesn’t seem to be coming to an end anytime soon, and his memorabilia will only become more valuable. Click here to get started on custom framing your memorabilia and be sure to visit csdframing.com for more information. 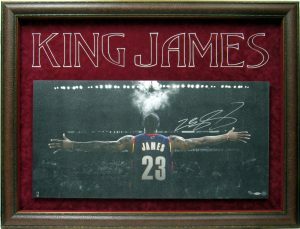 This entry was posted in Framing, Hall of Famers, History, Memorabilia, Sports, Sports Items and tagged autographed memorabilia, autographs, Cavs, Cleveland, Cleveland Cavaliers, CSD Framing, Custom, custom frame, framing, King James, LeBron, LeBron James, NBA, NBA Playoffs, Playoffs.